A PDF version of the Law Library of Victoria Collection Policy (PDF, 165KB) is available online. 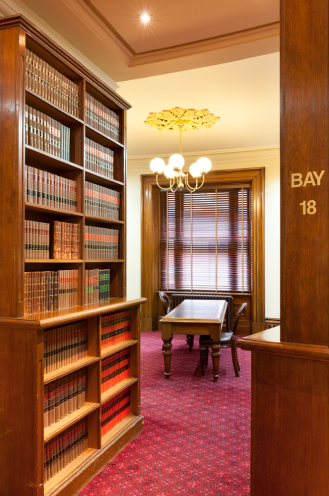 The Law Library of Victoria (the Library) was established in 2014 to provide a comprehensive and sustainable resource for the judiciary and the legal profession. The Law Library of Victoria’s aim is to create an enduring and pre-eminent legal information resource that promotes access to justice and enhances the administration of justice in Victoria through our renowned collection, services and community engagement. We are the preferred resource for the Victorian legal community. We are an aspirational model for other libraries. The Law Library improves access to justice for all Victorians by reducing barriers to access to legal resources for our members. We collate and curate the best range of legal information resources for our constituents. We assist with reference and research support, and improve skills in using legal resources across the community. We provide services that support the administration of justice in Victoria. The Collection Policy is the key strategic document that underpins the management and development of the collections of the Library. Ensures that the Supreme Court Library collection is maintained as a collection of national significance for the benefit of future generations. Primary responsibility for selection lies with the Manager, Collections and Technology. The Collections Librarian and Reference Librarians also have input into the selection process to review and identify materials for acquisition by the Library. The final decision-making for acquisition of items for the collection lies with the Director, Law Library of Victoria. Texts covering Victorian law are selected as a first priority followed by Commonwealth and interstate material. United States material is purchased if the subject matter under review has not been dealt with extensively by any of the common law jurisdictions listed above. In general, the Library acquires current material as a higher priority than acquiring retrospective material. Retrospective material is usually only acquired by donation, and is retained if it constitutes part of a back file of a current title, is likely to receive a high degree of use, or completes an incomplete set. Costs are considered based on the size and quality of the product, its value to library users and availability from other sources. The Library evaluates available formats on a case-by-case basis. Duplication of resources across collections is avoided unless it is deemed useful to have multiple copies at different sites. Links are provided via the Library portal to digital subscription material, e-books and relevant material that is freely available on the Internet. This policy assumes that library members have access to an acceptable level of connectivity for online access to facilitate use of digital and Web based resources. More detailed criteria are defined in the Library Collection Procedures. Resources obtained via subscription, including journals, looseleaf services and online databases are selected if they meet the selection criteria outlined in Section 2.2. Where hard copy is required, preference is to subscribe to bound volumes only (where a subscription includes parts or bound volumes). The Library actively pursues the purchase of monographs if they meet the selection criteria outlined in Section 2.2 of this policy. The Library Collection Procedures provide detail relating to subject areas collected. E-books are purchased only when they can be loaned via the Library catalogue or where a publisher provides electronic lending services. English is the predominant language of the collection. The Library accepts donations of hardcopy publications on the basis that they become the property of Library and any item not required will be offered for donation to other organisations, persons or discarded. Donations will be refused if material does not meet the selection criteria outlined in this policy or is already held by the Library and duplicates are not required. The cost of cataloguing, storage and conservation are also important considerations in determining acceptance, therefore donated materials may need to be accompanied by funds to cover those costs. The Library accepts donations of superseded material from other libraries if they meet the criteria outlined in this policy. All donations of collection materials to the Library are permanent gifts. The Library will not accept donations of material on a permanent loan. The Library does not usually accept donations with access restrictions, except for restricted Judgments. However the Library may accept materials which due to their rarity or value may be deemed important to hold in closed or restricted access. Once material is accepted and added to the Library collection, the Library reserves the right to catalogue, store, conserve and provide access to material at its absolute discretion. Monetary donations are also welcomed. Donations would be used to develop the collection in specific areas or for conservation purposes. The Supreme Court Library has deductable gift status. The Library provides a facility via the Library portal to recommend new items for purchase either via the Ask a Librarian form. Requests will be considered and if the material does not meet the selection criteria outlined in this policy the request will not be actioned. The Library will advise the requester of the outcome of the decision. The Library does not purchase copies of titles for Judicial Officers or Chambers collections, unless costs are included in annual Jurisdiction renewal schedules. The final decision to purchase a resource is made by the Director, Law Library of Victoria. The Library maintains a historical collection of publicly available judgments from all jurisdictions. Where permissible these judgments are made accessible on the Judgments Database via the Library website. Judgments are also made available electronically to AustLII, BARNET JADE and legal publishers as per the individual licensing arrangements with those entities. Restricted judgments are managed locally by the Reference Librarians in collaboration with their respective jurisdictions. Refer to our website for information on how to Access these judgments. The Library maintains an digital collection of welcome and farewell speeches. Access is via request to the Librarian on duty. The Classics Collection of 18th century books was collected during the early years of the establishment of the Supreme Court Library. It consists of a range of generalist texts and classic novels. This collection is housed in the Classics Room to ensure security. Access to the collection is at the discretion of the Director, Law Library of Victoria. The Library does not pursue additional purchasing to supplement these collections. However donations may be accepted. The collections are maintained for historical purposes and are included in the Library catalogue. The Supreme Court Library also holds many other rare and old books. Access to these items is at the discretion of the Reference Librarian on duty. A small collection of material relevant to the Koori Court is maintained in the Magistrates’ Court Library. It contains monographs, government reports and other related items. The development of this collection will be in accordance with the Selection Criteria in Section 2.2 of this policy. The Library also holds a small number of legal textbook collections from prominent retired Judges. Further incorporation of collections will be at the discretion of the Director, Law Library of Victoria. If a bound volume service is not available to a serial subscription the loose parts are sent for binding on an annual basis. Monographs are not sent for binding unless they are in need of reinforcement, such as softcover texts. The Library will collaborate with entities such as AustLII and loan rare library items out of copyright to contribute to AustLII’s Victorian Law Resources database. The Library will collaborate with other libraries such as the State Library of Victoria and the University of Melbourne to digitise all obtainable Victorian legal textbooks which are out of copyright. The Library will collaborate with the courts and VCAT on local digitisation projects, (such as annual reports and hardcopy judgments) which would be hosted locally. Other rare items which are only held by the courts and VCAT, but are considered of public interest for educational purposes, will also be considered for in-house digitisation projects. The Library actively seeks donations of materials to replace texts and reports to reduce the need for conservation and rebinding. Inadequate storage facilities and high usage have resulted in the deterioration of many items in the Library collection. To address this, it is intended that pending funding, a conservation program is scoped. Collection priorities will be set for items that should be saved first. Direct examination of the collection by Library staff or experts provides relevant information. All formats making up the collection for a particular subject area i.e. books, journals, digital resources, etc. are assessed on a regular basis. The adaptability of existing shelving arrangements. As well as general open-access shelves, designated stack areas are maintained in the Supreme Court Library and the Magistrates’ Court Library. Where offsite storage is appropriate, a Public Records Office of Victoria approved storage facility is used. The requirement to access superseded material that has been cited elsewhere. Superseded copies of loose-leaf services may be bound and retained for reference purposes, and are stored in the stack area. Where superseded resources are retained they will be clearly marked. Superseded material will be maintained in the stack area housed at the relevant individual library that is most likely to utilise that superseded material or offsite at a Public Records Office of Victoria approved storage facility. In the case of publications not required by other libraries or institutions, and unsuitable for sale, secure recycling disposal is arranged. Court Administration Authority (South Australia). The Consortia’s strategic objectives include facilitating co-operative collection development. In addition, the Library strives to cooperate with other substantial law libraries, such as the Melbourne Law School and the State Library of Victoria, to maintain a combined comprehensive collection available locally and nationally. This includes community legal service libraries, law firm libraries, university libraries and the Victorian Government Library Service. The Court Library Consortia shares a Library Management System (LMS) with each library contributing items to the catalogue. All Library resources are catalogued onto Libraries Australia and holdings added to the LMS. Any new original cataloguing input by the Law Library of Victoria will meet Libraries Australia required data elements using MARC21 (Machine-Readable Cataloguing) standards. The standard for subject heading classification in Libraries Australia is Library of Congress Subject Headings. The standard for name heading classification in Libraries Australia is Library of Congress Name Authorities. The Law Library of Victoria uses the 23rd edition of Dewey decimal classification and relative index (DDC 23) for assigning classification numbers. The Library will provide advice to Judicial Officers and Chambers to assist Chambers staff to manage collections located in Chambers or Satellite collections. Requests to absorb or merge library collections into the Law Library collection will be considered on a case by case basis by commercial arrangement. This policy will be reviewed periodically to meet the changing needs of the Library, judiciary and the legal profession.